We are leading wholesaler of superior quality Bike Helmet in the market at present. Also, we ensure the on-time delivery of the helmet in a very quick turnaround time. 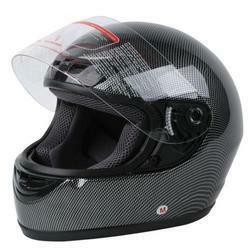 Carbon Moulding Helmets are considered to be one of the most strong and break-free helmets. In our wide range of products, we are superlative in offering best quality collection of Yellow Color Open Face Helmet that are designed for driving safety purpose that are available in open face design and yellow color. In line with client's diverse needs, we bring forth a distinguished range of the Motorcycle Helmet. We are a manufacturer and supplier of premium quality bike safety helmets, half motorcycle helmets, driving helmets, sports helmets, security locks etc. all our helmets are manufactured using high quality raw materials. We offer to our customers a superior range of bike safety helmet, available in various sizes and colors. These helmets are made of ABS Material Shell and provide maximum coverage to the face of the wearer. Our range is ideal to be used in any weather condition.They undergo various tests such as tensile, durability, crash, corrosion etc before they are send at the clients end. 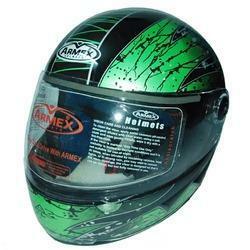 Full face helmet with ABS Shell, scratch resistant tool less visor and front, top and rear vents. Made to ISI 4151 Standards. Available in plain and graphic options.